The fruit and vegetables in most grocery stores come with little stickers on them that have a numerical code identifying the produce for the cashier at the checkout counter. This is quite useful for grocery store cashiers, but not so much for customers. Not only are these produce stickers annoying for customers, but they are most often not recyclable or compostable. Even though the labels are tiny they’re found on almost every loose fruit or vegetable sold, which soon adds up to a lot of waste. It may seem a little silly to go through the effort to grow natural, organic produce and then slap a non-recyclable plastic sticker on it! There are other options for labeling fruit and vegetables. One option is “Natural Branding” by Laserfood. Instead of stickers, this approach requires physically branding the skin of the fruit or vegetables using a laser. While we love this idea and it is currently being trialed, the initial start-up costs of purchasing the laser machine may be daunting for small to mid-size producers. While the laser does not damage the product, it’s also not yet clear how customers feel about “tattooed” produce. A better solution for this problem would be produce stickers made from compostable bioplastic! Fruits and vegetables are already “packaged by nature” in their own protective peel. The peel is natural, biodegradable and can be put straight into the compost. By using compostable stickers, the produce sticker can be composted right along with your fruit or vegetable scraps, you don’t even need to peel them off first. Our PURE Labels bio-plastic and bio-poly labels are water, grease, and oil resistant, making them perfect for use as produce stickers. They are also certified compostable in accordance with ASTM D6400 and EN13432 (including the adhesive!). 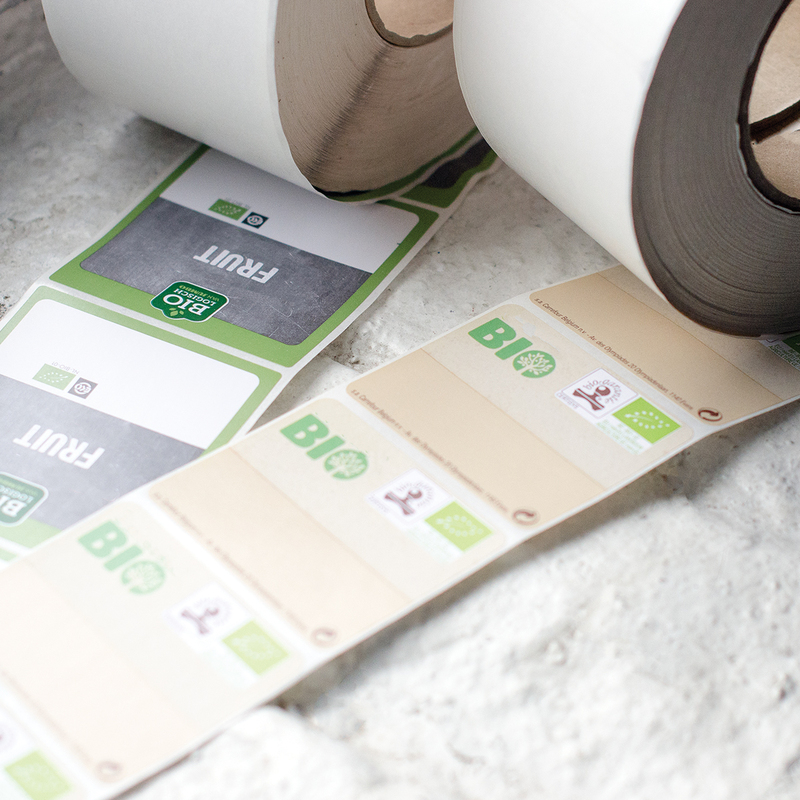 The Bio-Poly option is flexible, meaning it can wrap around tight corners and uneven surfaces - making it perfect for produce stickers. We can also create custom compostable produce bags, and compostable labels in a variety of materials (including Direct Thermal) to use with the produce bags. Call us +1.773.276.4554 to chat about your compostable packaging needs.